~Updated 2/10/2019 with a Valentine's Day Call Number Hunt~ Save 30% on this Bundle! Call Number Hunts will have your kiddos locating a book on the shelves in the picture book, chapter book, and nonfiction sections of your elementary library! In this fun seasonal activity, students read call numbers, search for the call numbers on the shelf, and look for picture clues that will help solve fun seasonal riddles! A great review of a necessary skill in a creative way. Your kids will thank you for setting this up! 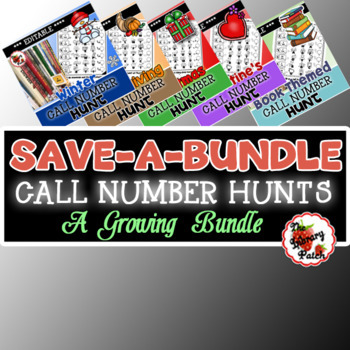 ** BUY NOW ** Purchase this bundle today and you will be getting ALL future Call Number Hunts for today’s price!! Just re-download each time that I make an addition. As I add new Hunts, I will be increasing the price just a bit. A purchase today will definitely save you money! (5) Read Me file for awesome directions to the hunts! Don't forget ... the call numbers are COMPLETELY editable in Microsoft Word! Simply open up the file and change the call numbers to suit your library!